The Norway–China trade deal – Is the environment still on the agenda? Following years of standstill, China and Norway this week ‘normalised’ their diplomatic relations and agreed to reopen negotiations on a free trade agreement. Good news for Chinese–Norwegian relations – but could it be bad for the environment? Normalization of relations is widely applauded as an important political victory in Norway. Official political relations between the two countries were broken in 2010, when Chinese dissident Liu Xiaobo was awarded the Nobel peace prize. The language used in the 'reconciliation' statement put together by Chinese and Norwegian authorities has already attracted attention and discussion. Some are asking what effect it might have on opportunities to raise issues of concern in Norway’s relations with China. To what extent will Chinese investments be welcomed in Norway, and what protective measures will be offered to such investments? Will Chinese investors be interested in the emerging mining sector in Norway, in Norwegian hydropower, and in salmon farming? Questions should also be raised, however, concerning the environmental ramifications of the reinvigorated trade talks. 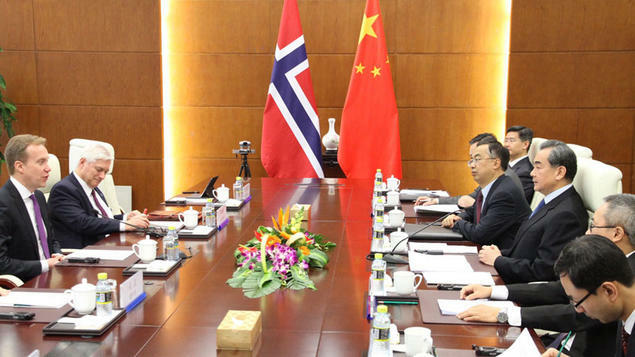 Just before diplomatic relations between China and Norway were placed on the backburner, Norwegian researchers, in collaboration with Chinese counterparts, completed an assessment of the environmental implications of a free trade agreement between the two countries. The study, conducted by Ole Kristian Fauchald, research professor at FNI and professor at the University of Oslo, and Haakon Vennemo, economist and chairman of Vista Analyse, highlights steps that could be taken to reduce any negative environmental impacts and provide a basis for sustainable development across a broad range of policy fields. Environmental impacts in areas such as salmon farming, mining and renewable energy are among the issues addressed. Fauchald hopes Norwegian authorities will study the impact assessment carefully and act on its recommendations. This will be a golden opportunity for Norwegian authorities to bring new and positive elements into the China - Norway relationship," Fauchald states. You can read the environmental assessment report here.